Scorpions have cancelled four German tour dates after Klaus Meine was given doctor’s orders to rest. The vocalist called a halt to the band’s show in Hamburg on Monday after 30 minutes, complaining of a sore throat. After being assessed by a doctor and diagnosed with an advanced viral infection and larynx and trachea inflammation, gigs in Cologne, Leipzig, Frankfurt and Berlin have been pulled. 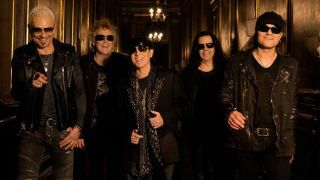 Scorpions have vowed to announce rescheduled dates for the gigs, including the Hamburg show, in the coming days. In a further statement, the band says: “On Monday evening, March 21, Klaus Meine had to break off the fifth of the nine German concerts in Hamburg Barclaycard Arena after just 30 minutes. The band will definitely make up this concert. The tickets for this concert remain valid for the new date. “Klaus Meine is currently undergoing medical treatment in order as quickly as possible to get the health problems under control again. This includes a medically pronounced ‘stage ban’ for the singer for several weeks. The band are due to tour North America from May 6 ahead of a return to Europe in June.